We are continually striving to make this history more complete. Please! If you are a former W2CXM member, share any stories or pictures you have with us and let us know what you are doing these days! The history of Amateur Radio at Cornell University can be traced back to 1915 when Cornell was issued the experimental station callsign of 8YC. In fact, the February 1916 issue of QST lists 8YC as having been heard at 1VN in Hartford, Connecticut, at a then remarkable distance of 400 miles. At the time the Cornell station was using a 1 kW spark transmitter. Other station callsigns during this period include 8XT and 8XU issued in 1916. According to various correspondence the 8XU callsign for Cornell was active for at least ten years. If the call letters seem odd to you, you must realize that at this time radio had not reached international organization - there were no country prefixes - and New York State was part of the eighth call district, not the second. Correspondence on file with the Cornell Amateur Radio Club includes a letter from Alfred Manchee, K2ALF, a Cornell Electrical Engineering alumni who “operated the Cornell wireless station in the 20's when the lid went off after WW1. The station was under the direction of Professor William C. Ballard.” In fact, it was Ballard who, in 1916, designed and built a 5 kW spark-driven transmitter that operated at 706 kilocycles per second and obtained a provisional license to operate it as an experimental wireless telegraphy station with the call 8YC. Just seven years before, Cornell had started offering it's first course in wireless technology, E 27 “Wireless Telegraphy and Telephony”, an elective for EE school seniors taught by Instructor William H. Kroger. Ballard took over instruction of this course in 1915 after Kroger departed from Cornell. The Cornell Amateur Radio Club as we know it today was formally organized in 1949 and three years later was issued the club call letters W2CXM which it holds to this day. Its early members were quite active in the American Radio Relay League's National Traffic System. The station has Brass Pounder League certificates dating from 1957-1958. W2CXM was issued its Worked All Continents award in 1955 and achieved DXCC in 1969 and has made contact with stations from such exotic locations as Albania, Mongolia, Antartica, Qatar, Nepal, and Ghana. The club has had a long affiliation with the ARRL and owns in its library a near complete QST collection dating from 1949 onward. We newly-minted hams arrived on The Hill in the Fall of 1948, only to find that antennas were prohibited on all the dorms and that there was no radio club on campus. Since Cornell was a Morrill Land Grant university, however, we all had the ROTC in common, and — thanks to Col. Warren — it wasn't long before we were allowed to fire up the gear in the Barton Hall Signal Corps classroom on the amateur HF bands, using AM, CW, and later RTTY. (SSB didn't exist then.) Main transmitter was the famous BC-610 (Hallicrafters HT-4), and receivers were BC-342s. We also got some SCR-609/610s going on 10-11 Meter FM, one of which we put in the Cornell Pilots' Club Piper J-2 for Cornell's first ham aeromobile station. As a matter of side-interest, Ithaca had no aviation radio whatsover until the CARC came along! We modified a war-surplus SCR-522 for AC-powered Unicom service and installed it in Ithaca Municipal Airport at the foot of Cayuga Lake. Tomkins County Airport hadn't been built yet. Our only regular air service was Robinson Airlines which flew some small twin Beechcrafts capable of using Ithaca Municipal's 1,200-foot runway. Robinson later became Mohawk, using DC-3s out of Tomkins County. Meanwhile, back at Barton Hall, Col. Warren scrounged a small room for us on the ground floor facing North — a hamshack of our own! Unlike the dorms, the College of Veterinary Medicine readily agreed to antennas strung from their building across to Barton, and using our own radios, we were now in business. Everything was either homebrew or modified surplus. Then we organized our motley crew. We had a dozen or so men and one cute, blonde coed whose name escapes me, but I think her callsign was either W2MVC or K2MVC. Our first President was Vic Wintriss. Others included Vic Clarke, W4OTR, Dave Zammat, W2WAL, Kirk Foucher, Claude Rochelle-Kagan, Dave Keiper, and Hugh Nutter. I was W2VZG at that time, a club member of course, but also heavily involved with Pi Tau Pi Sigma, the Signal Corps honorary fraternity. At graduation, we got diplomas in one hand and military travel orders in the other: alas, another war — Korea this time. Wintriss went Navy, Clarke to Air Force, and I to Fort Monmouth. While on the air in November 1963 a British station broke in to express his sadness over the shooting of President John Kennedy. I was shocked that I, an American, heard about the events in Dallas from a British subject. A moment later another ham located at one of our air force bases in Greenland asked if there was a way to learn more. W2CXM then became the “unofficial” rebroadcaster of CBS news reports of the shooting. I'm not sure that was legal, but I really didn't care at the time. I'm sure some our radio brothers went on to do some wonderful and exciting things. But, remember, we did our programming and math on punch cards, slide rules and motor driven mechanical rotary calculators. We would punch in our numbers and go out for a cup of coffee. When we got back, we either had the answer or found our calculator had danced off the table onto the floor. Basic was a new langugage and the most exciting thing on engineering campus was a TTY attached to the phone line connecting it to a far away computer system. As engineers we made a visit to the IBM plant making the new integrated circuits. They were very proud that their yield on 7400 chips was about 3 chips in 100. I went to Cornell BSEE '70, MBA '74, and was active at W2CXM during that time, and was president of the club around the '69 timeframe. Other calls that were active at that time were WB2CPV (now K1EA who wrote CT contest software) WB2CPU who has written several articles in the past few years, WA3HRV - now K3RV who does the propagation column in the NCJ. My call was WB2FGA - now N8ET - and any of your members who are into QRP might recognize my company - Kanga US - that sells QRP kits. I remember pieces of the antenna that is in the picture (above), but by the time I was a member we had a TH6 up on the tower. There was also an end-fed zepp that was strung between the two towers on Barton Hall, and as I recall it played quite well. It was fed thru a homebrew tuner that was mounted in the west window on the south wall of the tower. K1EA and K3RV used to do quite well in contests from W2CXM back in the late '60s and early '70s - both the DX tests and the ARRL CD parties. No memory keyers, but we had an early keyer (12AT7'a and a relay as I recall), and they could really make it play. One other comment for your historian - KA9Q - who wrote NOS for packet - was from Cornell, and I assume was a member of W2CXM. Moving the antennas to the South tower. Installing two runs of 7/8“ hardline between the towers along the catwalks in Barton. Station activity really picked up after moving the antennas. 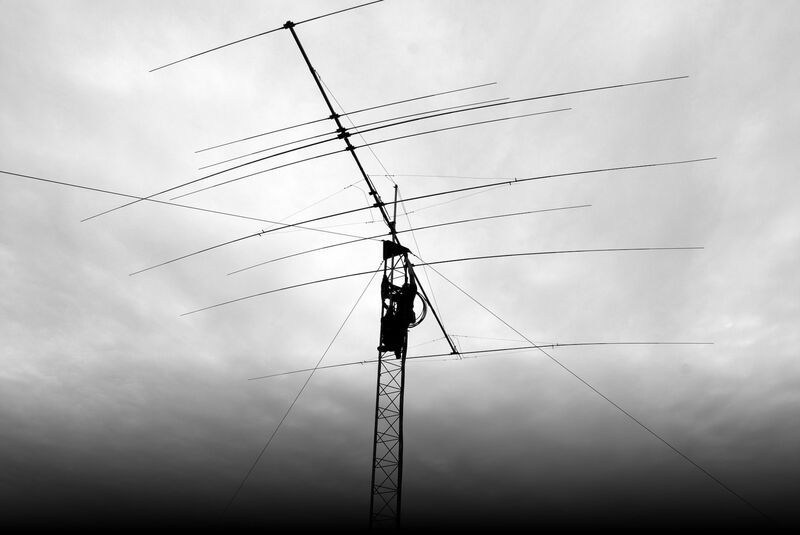 The TH6DXX tribander, tower, rotor, 7/8” hardline, and the F9FT 2-meter horizontal Yagi were acquired by the club in 1979. Running licensing classes for Novices through the Experimental College. Refurbishing the 2-meter repeater and converting it to microprocessor control using a SYM-1 6502-based controller that was programmed by paper tape! Linking the 10-meter repeater to the 2-meter repeater. Talking to people all over the country using 10-meters from a handheld 2-meter rig on campus was quite a kick. Converting old CB radios to 10 meter FM rigs. Receiving a significant “donation” from the Physics department in the form of a lot of old junk they were going to throw out. Some of this junk is probably still cluttering the closets of W2CXM, having never been used. One notable piece of junk was some avionics radar pod that looked pretty cool. In 1987, WA2PKP built a 24GHz Gunnplexer while he worked at M/A-Com, which was intended to serve as a two-way audio link between the repeater on Bradfield and the telephone line at the club station in Barton. It used an FM radio for the IF receiver. Following the Mexico City earthquake of September 1985, W2CXM played an important role in helping Ithacans contact friends and family there. An article about W2CXM appeared in the September 28, 1988 issue of the Cornell Daily Sun. With the late 1980's came the W2CXM cube radio, a simple 2-meter receiver made from a modified Radio Shack weather radio cube. The cube was originally designed for a tech/general licensing class to listen in on repeaters for code practice. Headed by advisor and former president, Steve Powell, N2BU, club members assembled and sold kits for the cube radio at local hamfests. Alex Rudd (President CARC, '86-'89), KA2ZOO, comments on the huge success of the project: “As Steve might attest, for all the money generated and pride taken, the weather cube project got to be a little overwhelming. We all had fun (I think) lining up assembly-line style to put together weather cube conversion kits and selling completed cubes at area hamfests, but most of us were pretty happy when the whole thing was over and done with, too.” An article about the W2CXM cube radio appears in the June 1987 issue of QST. In May 1998, W2CXM acquired a TS-790 144/440 MHz all-mode transceiver and began construction of an amateur satellite station. W2CXM, housed in the North West Tower of Barton Hall, Room 401, was active on all Amateur frequencies between 1.8 and 30MHz on AM, SSB, CW and RTTY. SSB, CW and packet activity were done on 2 meters. The club also operated a local 2 meter repeater. The club room is back in the hands of the W2CXM members. We have new members that are working hard to put everything back together. There is still a lot of work to be done, but we have operating radios back on the air for the first time in three years. If you're interested in helping contact Adam Mahnke KC2ANT for information on when working parties will be taking place, or for access to work on your own. Please join our mailing list for messages about when things will be taking place. We have been having weekly working parties/meetings, times and dates posted to the e-mail reflector. Possible future modes of operation include Amateur Television and Amateur Satellite. In an age of digital communication, the Internet, and personal cell phones W2CXM continues the prove the utility, need, and fun of Amateur Radio.